Working out what you need in order to set up for live video production can be quite a daunting task, not to mention the operational techniques that will be required to use it. What I mean by "live video production" is any sort of live transmission (typically over the internet these days), or video recording, that comprises more than a single source. In other words, anything that goes beyond recording direct onto a camera, or transmitting the direct output of a single camera. The "live" element is the switching and combining of multiple feeds, either from cameras, pre-recorded video playback, text-based captions, graphics & computer output and other remote feeds. At one time this would have required a fully-manned purpose-built TV studio or Outside Broadcast unit, but these days the entry-level hardware requirements are far more modest, and a surprising amount can be achieved by a single operator. Hardware will usually only do what it does when you buy it, so the argument goes, but software is far more more versatile and can be continually updated to provide improved features. Computers have changed the face of broadcasting in so many ways, and the benefits have certainly filtered down to all levels of video production, giving lower-budget users functionality that was once the exclusive domain of the TV networks. But it would be a mistake to think that computers are the answer to everything production-related, and that it's just a matter of finding the right app. Handling multiple streams of video in real-time, particularly at HD resolutions and frame rates, is not something you should expect to do on every laptop (yet), for example, and is one reason why there is still a place for some dedicated hardware. Off-loading the tasks which require the most "brute-force" to external hardware will leave the computer with more resources to do the things it's good at, one of which is providing a highly customisable work surface from which to control everything. But that in itself is another reason why there's still a place for hardware. There's only so much that can be done with one pair of hands using a keyboard and a mouse, or even a touch-screen. And not every task lends itself to these sorts of controls. Live audio mixing is a prime example of something for which hardware still offers a very effective solution. A row of sliding faders offers a tactile multi-finger user interface which is hard to beat at a practical level. Also, audio equipment generally is now at a fairly mature stage in it's development, with the possible exception of radio transceiver units, and any investment in things like good quality microphones, headphones and mixers is unlikely result in the same sort of rapid obsolescence as experienced with other electronic items like computers, phones, TVs and cameras. As such, buying used equipment is a perfectly viable option, and most of my personal professional audio kit was either bought new 20+ years ago, or has been bought as used items (mainly from ebay) more recently. Two of the software solutions I've used are VidBlaster and vMix, both of which are innovative vision control systems for Windows PCs that emulate many of the functions found in a TV studio or OB production control room video mixer. You can read a more general overview about them on the VidBlaster & vMix pages. So how do you get the best out of something like vMix? The first thing to realise is that the processing power required is directly proportional to the product of the frame size, frame rate and number of source modules in use. So broadly speaking, if you want to have quite a few HD video sources, You'll need at least a quad-core i7, perhaps even a hex-core i7 or an even faster Xeon workstation. More RAM, or fast disks (eg SSDs) won't help with the basic video throughput either if your CPU isn't powerful enough, although you will benefit a bit from having faster RAM, and SSDs will be make a difference if you're doing video replays or making multi-channel ISO recordings. However, the one other component which will make a significant difference to performance in vMix is the graphics card, and something from the Nvidia GTX range, with 3GB or more RAM, from the GTX 1060 up to the GTX1080, will give hardware acceleration to both image processing and video encoding. Another way of optimising performance is to try to ensure that all your video sources are actually delivering video to the computer at the same resolution and frame rate as you set for the profile. Any mis-matching video sources can be scaled on software, but if you feed in full HD video at 1920x1080 when you only need 1280x720 or even lower SD resolutions (eg 640x480), then you're giving the computer more work to do. 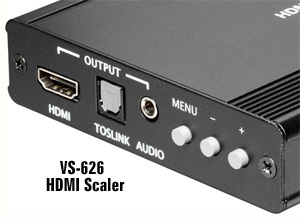 This is where off-loading such tasks to hardware can bring benefits, with HDMI Scalers like the TV One VS-626 (aka Atlona HD-560) providing both up/down re-sizing and frame rate conversion when needed. Of course the different ways of getting video into the PC will also have an influence on the end result, and not just in terms of video quality. Different devices can introduce differing amounts of video delay which will cause problems with audio lip-sync. Digital video processing inevitably causes some delay between input and output, but as long as it's constant for all sources then usually it can be dealt with by the addition of a single audio delay line. What is not so easy to deal with is having multiple camera coverage where each camera feed has been given a different delay by the particular input method or device used. In this respect, it's best for all devices to be connected through the same type of interface, either by using multiple capture cards of the same type, or cards which can handle multiple simultaneous channels. As a rule, internal cards which connect to the PCI or PCIe bus usually introduce the lowest delay, along with USB3 which is a very fast external serial bus. 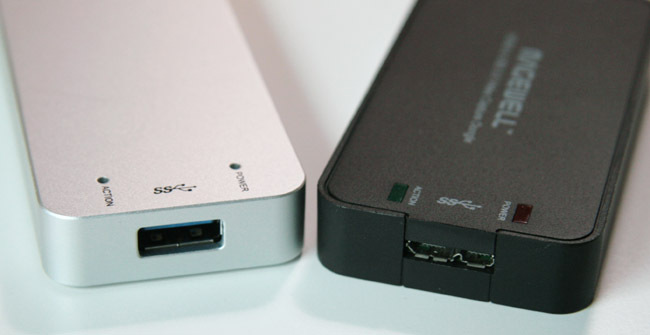 Other USB devices (of the EzCap type, which has SD composite and S-Video inputs), use the slower USB2 interface and introduce a little more delay. Firewire/1394 also inherently introduces an even longer delay when used for video transfer, and IP cameras are likely to be even further behind due to the buffering that's often required. 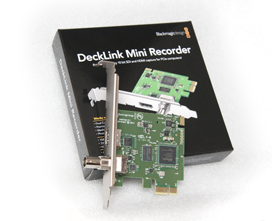 Suitable video input cards for use with vMix and VidBlaster include Blackmagic as well as the Magewell devices listed below, although we can supply and advise on other hardware that can be used. On the audio side we can supply a variety of audio I/O devices and cabling to meet most operational requirements. As well as 4K & UHD, these cards can capture at 2560x1440 at up to 12bit colour depth and YUV 4:4:4 sampling (for game capture). Lead time for non stock items is typically 3-4 days. 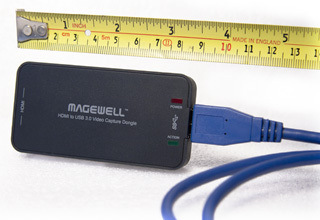 This versatile pocket-sized USB3 video & audio capture device for Windows will accept a wide range of graphics card output sizes via its full-size HDMI input connection, as well as regular broadcast video resolutions, either SD or HD, interlaced or progressive, with embedded 48KHz stereo audio. It will auto-detect the incoming video resolution and can scale it externally to a range of common resolutions, from 640x360 to 1920x1200, at frame rates up to 60p. An SDI/HD-SDI version is also available for capturing broadcast video resolutions with embedded stereo audio. It requires no drivers to be installed, as it emulates a standard webcam and uses the default Microsoft drivers (included in Vista, Windows 7 & 8), making it suitable for use with any streaming or capture software designed to allow a webcam for input (via DirectShow). This includes applications like Adobe's Flash Media Live Encoder, Skype, Google+ Hangouts, Wirecast, VidBlaster, VMix, XSplit, etc. Embedded audio is supported, such that the unit appears in the standard list of Windows audio Recording devices (as pictured right). The HDMI capture dongle has been tested with a range of USB3 host chipsets, including Intel, NEC/Renesas , Asmedia - although we can't guarantee every permutation of chipsets and drivers (but it seems far less fussy than the BM Intensity Shuttle!). The Magewell spec indicates support for Linux (kernel version 2.6.38 and above), OS X (10.8 and above), but we have no facilities to test under those O/Ss. Whilst it requires a USB3 connection to deliver the bandwidth needed for HD video at full frame rate, it will work over a USB2 connection with a couple of caveats, which are either, (1) Reduced frame rate, which can still provide a viable solution for inputting something like a Powerpoint presentation in HD resolution where the images are mainly static, so a reduced frame rate is acceptable, or (2) Reduced image size being fed to the application, being scaled externally in the device before being sent over the USB2 link. 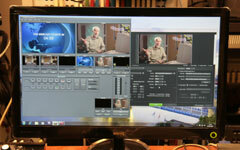 This can allow the use of HDMI feeds from HD cameras in webcasts with lower pixel resolutions. For example, a full HD 1920x1080 camera feed can be connected to the dongle but, by selecting 640x360 in the software application, only a 640x360 image is sent over the USB2 link, but at full frame rate. No software is supplied with the item - just a suitable USB3 cable (for use with standard USB3 or USB2 host sockets on the computer). See Magewell prices above and watch the video below (or go to http://youtu.be/_OT0GoALSLM ). ZEN Computer Services can offer a back-end service to support live web streaming for smaller-scale events, product launches, training sessions, and suchlike. The service is aimed at video production companies and videographers with little or no prior experience of web streaming who have been asked to provide such a service as an add-on to existing video coverage. At its simplest level, ZEN will provide the encoding equipment and operator, and provide quality-control monitoring of the stream during transmission. The supporting services can be extended to include audio mixing and software vision mixing, allowing multiple cameras to be used, along with caption overlays and vision inserts from virtual VTRs. Whilst not intended as a replacement for a full OB, the system allows many of the same elements to be included in a live web broadcast, operated from a desktop PC, at a relatively modest cost. Copyright � 2019 Zen Computer Services.